Avatar has always been a favorite movie of mine. And I really did not expect myself to be a fan at all, but after seeing it in theaters in IMAX, I got obsessed. The storyline isn't highly original or anything, (nothing is original anymore), but just the absolute precision and attention to detail and voice acting and artwork of the film is second to none. James Cameron did an incredible job producing the film and I love watching it whenever it's on TV. It's on quite a bit, actually. Recently Disney rolled out a Pandora and Avatar themed part of their Animal Kingdom park. It looks so incredible. I really want to go and see it in person. From the videos on YouTube that I've watched, I'm so impressed. Even the food at the park is themed to match that of the land of Pandora. So cool. "Guests enter Pandora via Alpha Centauri Expeditions, a sort of intergalactic travel agency; there they learn about the work of the Pandora Conservation Initiative. The preservation theme loosely connects the fantasy land to Animal Kingdom, which emphasizes environmental restoration and the efforts to save endangered animals from extinction. On Pandora, for instance, the winged, dragon-like “Avatar” creatures called the banshees are now near extinction — a key component of the land’s thrill ride, Avatar Flight of Passage. Close to the entrance of the park is a giant, bulbous plant with a fire-red top known as the “flaska reclinata,” the last of its kind. Joe Rohde, lead imagineer on the project, stressed that even though the sci-fi world is far from “edu-tainment,” all of it works to give Pandora a sense of fragility, attempting to draw parallels between this alien world and our own. Disney had one primary goal for the Na’Vi River Journey: “Just plain beauty,” said Rohde. The boat attraction floats calmly through a bioluminescent forest, culminating in a visit with the Shaman of Songs, a Na’Vi woman who serenades guests as they pass by. It’s intimate, with boats seating only about six to eight people at a time and two boats loading at once. Floating jellyfish creatures soar through the sky, wolf-like predators trot off in the distance and other four-legged animals puff up their feathers as guests roll past. Above, glowing blue plant leaves reveal the footprints of small animals as they run across the fronds. But the star of this show is the Shaman of Songs. She is Disney’s most lifelike audio-animatronic created to date, with near-human-like fluidity in her movements. The first time you see her you don’t know where to focus. On her singing? Her arm waving? The wagging of her tail? The two attractions in Pandora don’t come with typical theme-park-like signage. The entry to the River Journey queue is a woven monument to the Shaman of Songs, and Avatar Flight of Passage greets guests with a sculpture of a banshee designed to look like an ancient carving. Sightings of Pandora natives, the Na’Vi, are relatively rare. They can be spotted on the two attractions, but throughout the grounds of Pandora their presence is treated as more of a special experience. Disney Imagineers explained that it simply wasn’t practical — or realistic — to have the Na’Vi wandering the land or doing meet-and-greets with guests. Part of that is due to their specific look. The Na’Vi are tall — generally towering over humans by 3 to 5 feet. They also have a very sleek bone structure and wildly active tails; it’s not as simple as painting someone blue, Rohde explained. Disney has long played up the bioluminescent nature of Pandora, and in the film we see the forest floor react to each step of the Na’Vi. Pandora isn’t quite that responsive, but there are multiple ways in which the land reacts to guests. At night, a significant number of the land’s plants light up. But the effect is not as simple as, say, turning on Christmas lights. The hope is that the glowing plants will feel natural. To that end, every plant in the land was hand-sculpted, and Rohde demanded that they be photo-realistic. Outside of the controlled experiences, the bioluminescent plants are mixed in with real plants that thrive in central Florida. 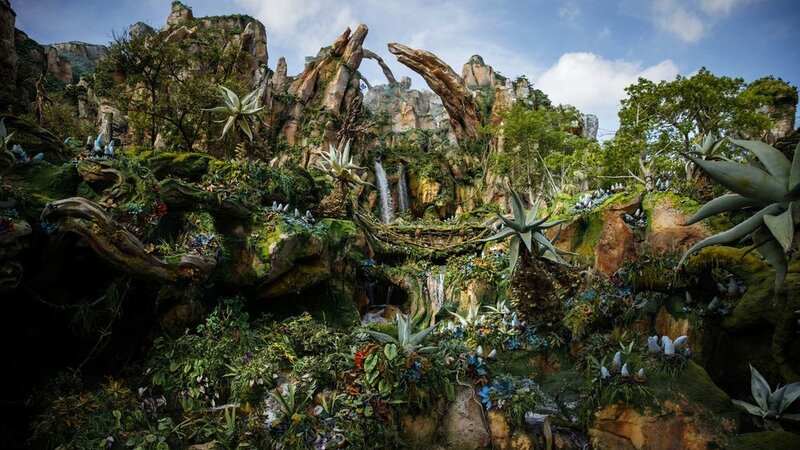 When the land opens later in May, the plan is for plants to react to Pandora wildlife. Guests will hear animals rustle beside the path, and the lights will flicker as the unseen animals push them aside. There’s even a set of plants that can be played like drums. They weren’t turned on for the media preview, but when they’re operational the plan is for the lighting of the land to respond to guests playing them. Throughout the day, “professional” plant drummers will also give performances for guests. Even the aforementioned flaska reclinata is interactive, releasing mists of water into the air. Throughout Pandora, multiple Disney cast members — employees, in park parlance — act as expats who are there to educate tourists on Pandora plant life. Visitors should also expect to encounter some Pandora creatures in the water. Though parts of Pandora were still being worked on and were off-limits to the press, there looked to be aquatic creatures situated in the river. And a sign warning guests in the splash zone. Pandora’s thrill ride is big — really big. To reach it, guests must trek up a Disney-constructed mountain. Consider it a light hike, but the queue path wraps around the “natural” Pandoran flora and fauna. Once guests reach the top of the mountain, they enter caves that house giant paintings depicting the banshees and colorful, ancient-looking murals. Slowly the queue transitions to what feels like an abandoned military base, with hints of once-dangerous experiments conducted by humans on Pandora, only to eventually open up into a full-fledged research center. This is where guests become avatars — that is, they go through the process of entering a Na’Vi body — to help the natives study and repopulate the endangered banshee species. The transformation is the story line of the attraction, complemented by the famous Na’Vi host body tank from the film and copious sci-fi details. In one room each rider is assigned a number and told that they are being scanned for the avatar process. Early on the tour of Pandora, Rohde cautioned that those who venture into the land simply to ride two attractions and bolt are making a mistake. You’re “wasting your time,” Rohde said. Among all of Disney’s themed lands in North America, Pandora stands out for its emphasis on individual experience rather than a linear story. Neither the Na’Vi River Journey nor Avatar Flight of Passage come with a straight-up plot, allowing visitors to take in the sights and sounds and write their own story. Though tied to the newer “Avatar” film, the Pandora rides recall the Disney of old — the take-it-all-in scenes of Pirates of the Caribbean and the Haunted Mansion, where fans to this day still debate the ins-and-outs of the story. Plus, the real-life nature of it should encourage guests who fall for the land to linger. The floating mountains, for instance, are an impressive sight. Guests can walk under them and view them from multiple locations in the land. Each one is natural wonder, even if at its base it’s constructed of steel and the mountains float due to some expertly disguised vines. They look like something that should be in a national park rather than a theme park" (LA Times).